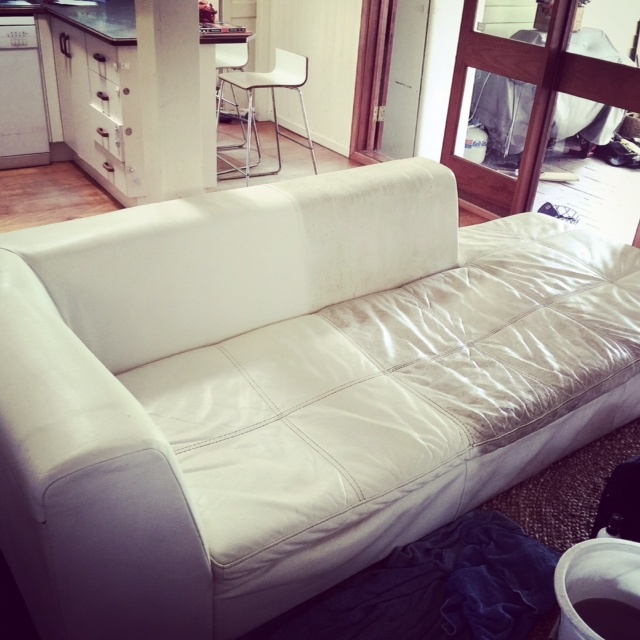 SICK OF LOOKING AT YOUR DIRTY, HARD LEATHER SOFA? LET US HELP! WILL CAN REJUVENATE & RESTORE YOUR LEATHER WITH A PROFESSIONAL CLEAN AND CONDITIONING SERVICE. Is your previously beautiful, white leather lounge looking dirty, dull and grey, rather than feeling soft and smooth? Just Imagine if you could get it looking and feeling as good as the day it arrived! Look no further, Will is also our leather cleaning expert and knows the method behind getting your leather back to it’s best! Leather furniture can be tricky to clean not to mention time consuming, with some cleaning products drying out the leather once you have cleaned it.This is where Will comes in. He knows everything there is to know about leather cleaning and will not rest until your furniture comes up in the best possible condition. First, your leather is thoroughly wiped over with a damp cloth to get rid of any surface dirt and dust which usually sits on top of the leather. Will then gets started on cleaning each section at a time with a cream cleanser and a very soft hand bristle brush, there is no easy way to do this! The small brush helps to bring any embedded dirt to the surface and it is then wiped away. This process can take several times going over the same section to remove all the dirt. This takes a great deal of time and care to ensure that your leather is slowly being restored. Another wipe over each section with another damp cloth will remove the last bits of cleanser making sure that the sofa is left squeaky clean. Last but not least a generous layer of conditioner is rubbed into each section leaving it soft, smooth and with a slight shine. To be able to provide a quote we first will need some information about the piece or pieces of furniture that you are wanting cleaned E.G How many seats? Condition of the leather etc? Taking a picture and sending it us is also an easier to send you off a quote. Otherwise if your prefer to call our lovely office team or fill out a QUICK ENQUIRY FORM, or DETAILED ONLINE ESTIMATE FORM ,you will be sent through a quote and be followed up with a call to answer any questions.